Navy Blue and Gold are Orion's colors! The cap and gown are navy blue, and the tassel is blue and gold. Learners who are going to attend the graduation ceremony will need to purchase the set; however, learners who are not attending, will want to purchase a set for pictures! The photo shows a Gold Honor Chord which may be purchased separately. For cap and gown, here is the size chart - Please note that the second set of options +15.00 is for full fit. Please be sure to order the correct set! 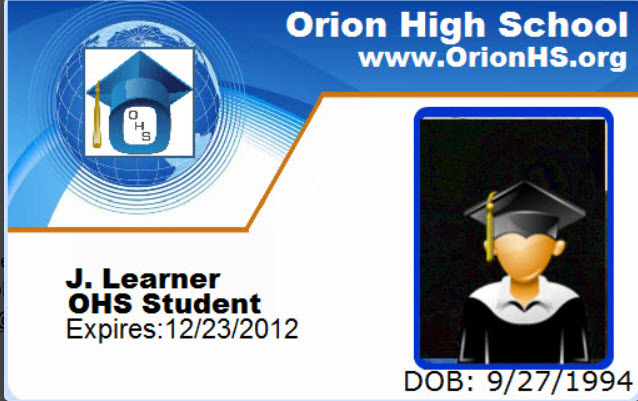 Learner ID Card. Price includes shipping. You must upload a clear face picture.